Democrats say that Republicans are for corporate America, yet President Obama’s Department of Energy gave Abound Solar of Loveland, Colorado $70 million in loans in 2010. It filed for bankruptcy in June of this year and likely doesn’t have enough assest to even repay a fraction of that loan. At least Haliburton is still in business and actually provides services and goods to both the public and government. Oh, and how many jobs did that $70 million produce? 125! You can do the math. In essence, not only does the Obama administration funnel vast sums of money to corporate America, they seem to have a penchant of picking losers in the process. Is that what the Democrats mean by being for the working man? Screenshot from Abound Solar’s website. 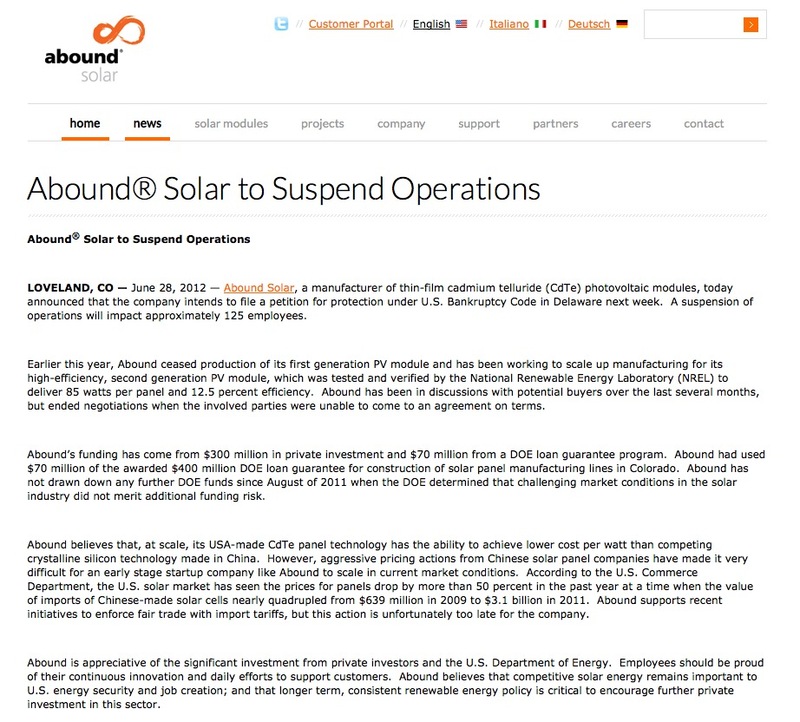 LOVELAND, CO — June 28, 2012 — Abound Solar, a manufacturer of thin-film cadmium telluride (CdTe) photovoltaic modules, today announced that the company intends to file a petition for protection under U.S. Bankruptcy Code in Delaware next week. A suspension of operations will impact approximately 125 employees. Earlier this year, Abound ceased production of its first generation PV module and has been working to scale up manufacturing for its high-efficiency, second generation PV module, which was tested and verified by the National Renewable Energy Laboratory (NREL) to deliver 85 watts per panel and 12.5 percent efficiency. Abound has been in discussions with potential buyers over the last several months, but ended negotiations when the involved parties were unable to come to an agreement on terms. Abound’s funding has come from $300 million in private investment and $70 million from a DOE loan guarantee program. Abound had used $70 million of the awarded $400 million DOE loan guarantee for construction of solar panel manufacturing lines in Colorado. Abound has not drawn down any further DOE funds since August of 2011 when the DOE determined that challenging market conditions in the solar industry did not merit additional funding risk. Abound believes that, at scale, its USA-made CdTe panel technology has the ability to achieve lower cost per watt than competing crystalline silicon technology made in China. However, aggressive pricing actions from Chinese solar panel companies have made it very difficult for an early stage startup company like Abound to scale in current market conditions. According to the U.S. Commerce Department, the U.S. solar market has seen the prices for panels drop by more than 50 percent in the past year at a time when the value of imports of Chinese-made solar cells nearly quadrupled from $639 million in 2009 to $3.1 billion in 2011. Abound supports recent initiatives to enforce fair trade with import tariffs, but this action is unfortunately too late for the company. Read more….